Finally, summer has arrived in Switzerland and I couldn’t be any happier about it. I spent the last sunny days like probably most of you outside and really got impatient to get a nice tan. 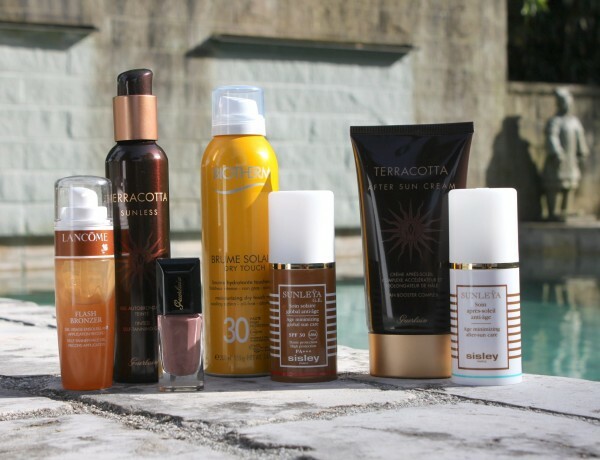 Here is a post dedicated to my favorite beauty musts for the sun. Whether you want to look slightly sun-kissed or savagely tanned, these bronzers and spray tanning products will deliver. LANCÔME Flash Bronzer Self-Tanner Gel gives you the perfect glow in a record application. GUERLAIN Terracotta Sunless Tinted Self-Tanning Gel smells well and gives you a golden skin tone in a second. GUERLAIN Terracotta Sun Celebration La Lacque Couleur in 602 Tonka Impériale. This limited edition nail polish has the perfect shade to match your summer tan. BIOTHERM Brume Solair Dry Touch SPF 30. I love this ultra-sheer, oil-free and waterproof sun protection spray for the body that leaves a dry and matte touch. SISLEY SUNLEŸA G.E. Age Minimizing Sun Care SPF 30 is the “Rolls-Royce” among the sun protection products and I love using it specially for my face. It is waterproof, protects and also minimizes the signs of aging. GUERAIN Terracotta After Sun Cream prolongs your tan and restores comfort to the skin after a day in the sun. SISLEY SUNLEŸA Age Minimizing After-Sun Care is the best product to minimize aging due to sun exposure. It hydrates and cools your face. I like to use it as a mask.